Mary Hoyer 14" tall, all composition with side glancing, painted blue eyes and painted eyelashes. The Mary Hoyer Doll Manufacturing Company history began in 1925 as a yarn and craft shop in Reading, Pennsylvania USA. Mary designed knitted goods for infants and children and later added a slim doll that could model her clothes along with a pattern book, this doll was supplied through an agreement with Ideal Novelty & Toy company, so early dolls only bear the Ideal markings, this was the Mayfair doll with a body twist waist, although the clothing should have the Hoyer label. Around 1937 Mary approached Bernard Lipfert a well known doll sculptor, to create her own doll, it was a composition doll, that was produced by the Fiberoid Doll Products Co. in New York, for the Hoyer company. These dolls will often be marked: The Mary Hoyer Doll in raised print. Dolls are all composition, wigged, most have blue sleep eyes with a lid above the eye (some are brown), real upper lashes, painted lower lashes and a closed mouth. Some dolls have painted eyes with painted lashes, these may be from the era of World War II (1935-1949), when supplies were hard to come by. After 1946 the Mary Hoyer dolls were made of hard plastic and are often marked; ORIGINAL Mary Hoyer Doll Made in USA (some composition dolls have this marking too) and some dolls were marked: Made in USA within a circle without the Mary Hoyer name and could be dolls bought, dressed and sold by other doll makers, see related page links for each those companies. 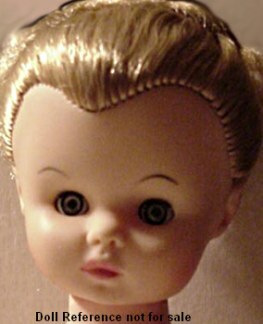 The Mary Hoyer Doll company closed in the 1970s, however family members reintroduced a vinyl 13 1/2" Mary Hoyer doll about 1991 and sold to the present. 1925 Mary Hoyer doll, 13" tall, Mayfair body by Ideal with twist waist and upper torso, all composition, jointed body, wigged, sleep eyes. 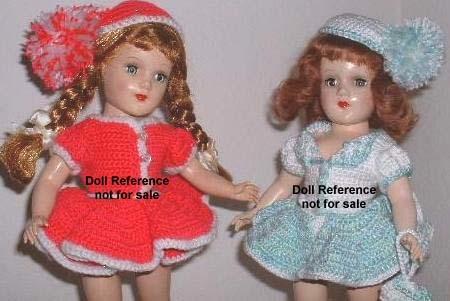 Doll was manufactured by Ideal, sold to Hoyer who redressed and sold the doll. Doll is marked Ideal Doll. If she does not have Hoyer marked clothing or her original box - your out of luck to make a correct ID as a Hoyer doll. 1937-1946 Mary Hoyer doll, 14" tall, all composition jointed doll, mohair wig (some have molded hair beneath the wig), sleep eyes usually blue but some root beer brown have been found, or painted eyes with painted lashes, real upper lashes, painted lower lashes, closed mouth, many different outfits were made for this doll, as well as patterns were sold, that could be knitted or sewn by the dolls owner. Mary Hoyer made clothing will have a Mary Hoyer tag. Doll marked: The Mary Hoyer Doll in raised print. 1937-1946 Mary Hoyer doll, 14"
1946-1950s Mary Hoyer doll, 14" tall, all hard plastic, jointed body, mohair wig many colors & styles, some with molded hair beneath, usually blue sleep eyes. closed mouth. Doll marked: Original Mary Hoyer Doll inside a circle. 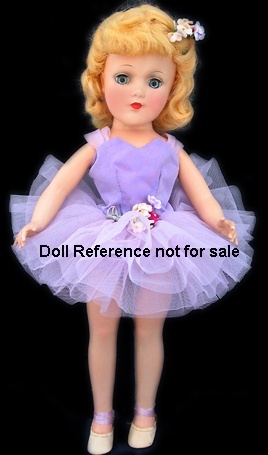 Shown Mary Hoyer doll, blonde, hard plastic, in her lavender Hoyer marked tutu. Many different outfits were made for this doll, as well as patterns were sold, that could be knitted or sewn by the dolls owner. Mary Hoyer made clothing will have a Mary Hoyer tag. 1948-1950s Mary Hoyer doll, 14"
1937-1946 Mary Hoyer boy Doll, 14" tall, all composition or 1946-1950s all hard plastic, jointed body, wigged with short hair (this doll is often thought to have had a haircut), sleep eyes, closed mouth. Doll shown on right in the original Prince tagged clothing. Marked same as above hard plastic girl: Original Mary Hoyer Doll inside a circle. The boy, male Hoyer doll commands a slightly higher price, as they did not make as many, thus, supply and demand from collectors today make him rather hard to find in good condition. 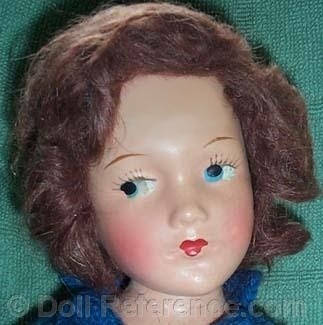 1950s Mary Hoyer Gigi doll, 14 or 18" tall, all hard plastic jointed strung body, wigged, sleep eyes, closed mouth, both sizes should have the Mary Hoyer Doll mark within the circle, very few of these dolls were produced, made by the Frisch Doll Company. 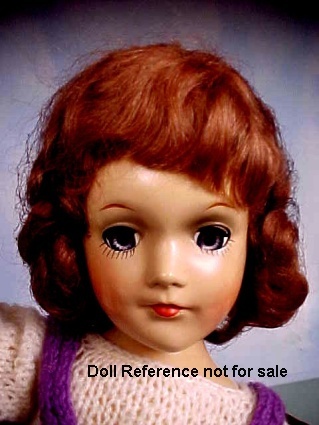 If your doll is an unmarked, it's likely to be from another doll maker, possibly a Nancy Ann Style Show doll if 18" tall, whose face is often mistaken as Gigi. Doll shown is the 18" tall Gigi, hard plastic jointed strung body, hard plastic head, auburn hair wig, blue sleep eyes, real upper lashes, closed mouth, dressed in elegant pale blue and tulle gown. 1957 Mary Hoyer Vicky doll, 10 1/2" tall, vinyl head on a hard plastic jointed fashion body, twist waist, rooted hair, high heeled feet. 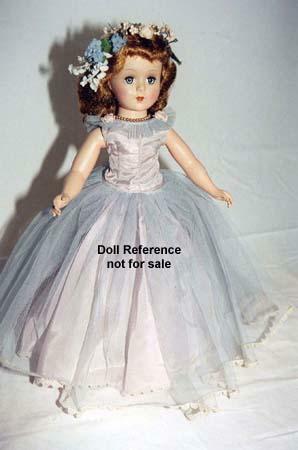 Vicky is marked Uneeda on neck and was purchased, dressed in sportswear to formals and sold as a Hoyer doll. (it's Uneeda's Suzette doll). 1957 Vicky doll, 10 1/2"
1958 Mary Hoyer Margie doll, 10" tall, all vinyl doll with short rooted hair, sleep eyes, closed mouth, toddler type jointed body, doll marked AE. Doll will need her original box, tagged clothing to be sure it's the Hoyer sold Margie doll, as many other companies used this same face mold and sold it as their doll. Here are some other doll makers that used this Effanbee Fluffy type doll mold without the Effanbee marking with or without freckles: Allied Grand Doll Company named their doll Bonnie, Kellogg's doll was named Linda Lou used as a mail in premium Advertising doll who is unmarked, Mollyes called her Perky also unmarked and Valentine used her for the 13-15" tall Perfect Patient doll unmarked, and possibly other manufacturers may have dressed and sold this doll as well. 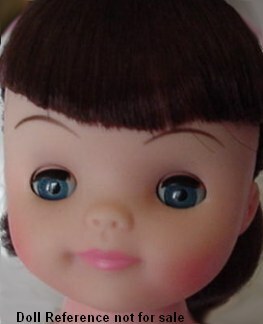 1960s Mary Hoyer Becky doll, 14" tall, all vinyl doll with rooted hair, sleep eyes, closed mouth, jointed body, marked on head AE. Probably purchased from Allied Grand Doll Company, dressed and sold by Mary Hoyer. 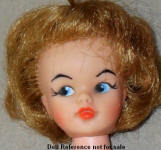 1965 Mary Hoyer Vicky doll, 12" tall, all vinyl doll with rooted hair, jointed body, doll marked AE on back of neck. Probably purchased from the Allied Grand Doll Company as this is the same head mold they used for their Tammy clone doll, with the three painted corner eyelashes, dressed and sold by Hoyer. 1961 Mary Hoyer Cathy doll, 10" tall, vinyl infant doll with a baby jointed body, made by the Unique Doll Company, doll mark is unknown. 1962 Mary Hoyer Janie doll, 8" tall, vinyl body, baby type doll, it's unknown at this time what company actually made the Hoyer Janie doll, doll mark is unknown. 1991+ Mary Hoyer vinyl head dolls, 13 1/2" tall, rooted hair, real eyelashes, doll marked MARY HOYER DOLL CO.